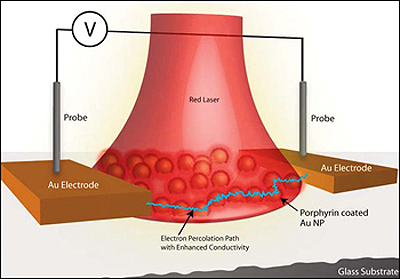 A schematic of a hybrid molecular device shows metal electrodes connected by a percolation pathway composed of dithiol-PZn3-coated Au nanoparticles. The Materials Research Society’s May 2010 MRS Bulletin includes a story on research completed by MSE Ph.D. student Parag Banerjee during a recent internship at the University of Pennsylvania. Banerjee’s advisor is Maryland NanoCenter Director Gary Rubloff (MSE/ISR). The paper, Plasmon-Induced Electrical Conduction in Molecular Devices, originally appeared in the Feb. 23 issue of the American Chemical Society’s ACS Nano journal. Banerjee’s co-authors are Dawn A. Bonnell, David Conklin, Sanjini Nanayakkara and Tae-Hong Park of the University of Pennsylvania; and Michael J. Therien of Duke University. The paper demonstrates the ability of surface plasmons to alter the electrical properties of a molecular junction by coupling gold nanoparticle arrays with highly conjugated, chromophoric wires. Since molecular compounds exhibit a wide range of optical and electrical properties, the strategies for fabrication, testing and analysis elucidated in this paper can form the basis of a new set of devices in which plasmon-controlled electrical properties of single molecules could be designed with wide implications to plasmonic circuits and optoelectronic and energy harvesting devices.